The viewer actively participates in the art, and thus is essential to its completion; however, they are also separated from the work itself (viewing it from the outside through a window). They are not completely immersed in the new dimensions of motion and sound, so how enriched is their perception of their pulse? The viewer experiences their own heartbeat in a new way, but are separated from it and now experiencing it from a distance. The choice of color is quite interesting as well. 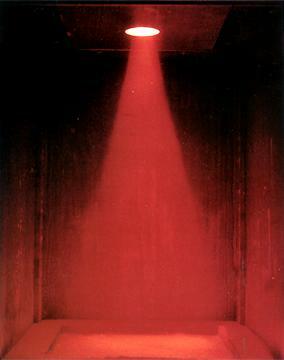 The deep red of the light is reminiscent of blood and the frequency of the light is one that excites the senses . The viewers reaction to this color would play a role in the piece itself because it would be evident in the rate of their pulse. The loop that is then formed by this realization causes a never ending chain of reactions (or interactions) between viewer and installation, each responding to the other. 1 Edward A. Shanken, Art and Electronic Media, (Phaidon Press Limited, 2009), 21. 2 Wassily Kandinsky, Concerning the Spiritual in Art, (1911). 3 Art and Electronic Media, Asociacion Arte Concreto-Invencion, Inventionist Manifesto, (1946).